This vehicle looks a lot like Toyota Auris. These two vehicles are based on the same platform, although IM looks a little bit more sporty. It has lower stance, it is significantly wider and it comes with 19 inch alloy wheels. Another thing that gives this model a more sporty look than the one that comes with its oversees cousin is the more aggressive front fascia and more sporty suspension. There is still no news about this vehicle’s performance. Some say that it is going to come with drivetrain similar to the one that’s seen in Toyota Corolla line up, while the others think that all exterior, interior and performance are going to be derived from the European Toyota Auris. This would mean that the new vehicle would receive 1,8 liter four cylinder engine under its hood, with 134 horsepower, which is the output of the current model Toyota Auris. To us this sounds just to boring to be true and we think that with all these sporty improvements and announcements directed to the younger crowd, this vehicle is definitely going to come with something more powerfule and more fun, probably some smaller turbocharged unit. Vice President of Scion Dough Murta announced that the new vehicle is going to cost around $20,000.this is very affordable, especially comparing to some competition models. There is also a possibility that starting price of this model is going to be $25,000. If this happens it is going to come with more luxury inside the cabin and probably some more hi tech features. This vehicle is made to compete with Ford Focus, Mazda3, Hyundai Elantra etc. 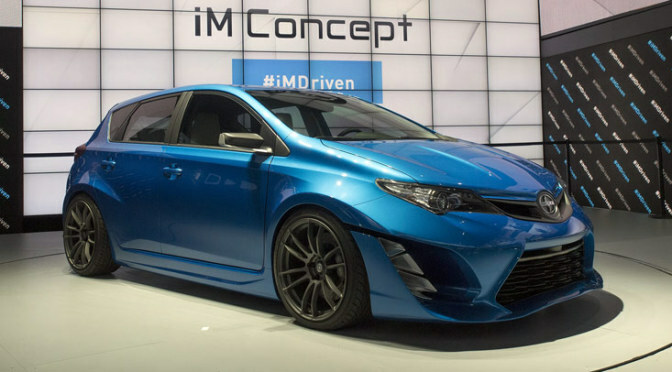 As Dough Murta pointed out this sales of compact hatchback models on American market is going to grow significantly in the future, and that’s why Scion started this adventure with IM model. There’s also a possibility that some of the three new models that he announced is also going to be compact hatchback.